Making tortillas stirs up a tantalizing, sweet corn scent. This weekend my daughter and her sweetie visited, and after a chilly hike in the woods, we were hungry. I pulled out a recipe I’d been raving about – Vicki Brett-Gach’s Spicy Three Bean Veggie Chili , a delicious version that sates a person’s yen for chili and barbecue simultaneously – and we all got to chopping. Four cutting boards, four knives. Chatting all the way. Laughing over how one person cuts celery versus another. Measuring out spices. Colorful, and fragrant. I’d been eager to make Mary McDougall’s Fresh Corn Tortillas, so we did that too: mixing masa harina (corn flour) with hot water, letting it rest while we finished chili prep. Love the corn-y aroma. I cut the dough ball into 16 equal sections, rolling each into a ball. 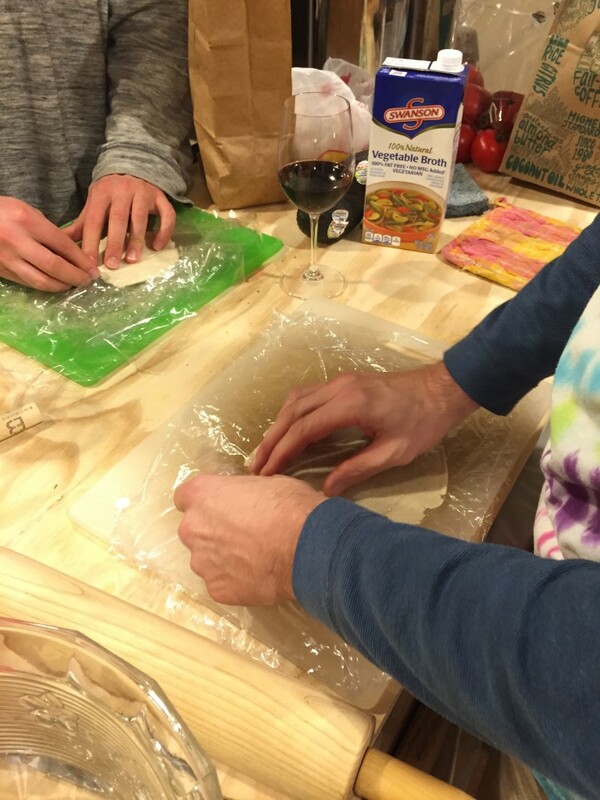 Wielding rolling pins, the two guys flattened the tortillas while I cooked them in non-stick skillet. “Cooking tortillas” feels like an overstatement. You drop the flattened dough onto a hot nonstick skillet, wait until the edges begin to curl, then flip, wait for more curl, then slip the finished tortilla into a pan in a warm oven until all are complete. Cooking tortillas feels more like heating them, with a responsibility to enjoy their savory fragrance, and enjoying the delicious corn scent. Tortillas complete, we sat down and enjoyed them warm as an appetizer. I cut an avocado in half and brought out the salsa; we made up our own tortilla rolls, spreading them with a little avocado and then salsa to taste. Oooh, yum. Then the chili. Damn this version is good. Chili with a barbecue accent. A symphony of flavors. Two big bowls each. A pie plate full of the finished product: warm tortillas. Yum. The whole scene reminded me how much fun it is to cook together. Hands busy, talk flowing freely and if conversation stalls, or someone asks a question no one wants to answer, ahem, well, work fills in. “Where are we on those carrots, eh?” And on you go. If you have more folks than work, people can pitch in refilling wine and water glasses and being color commentators, setting the table. It’s a shared experience, no doubt one of many remember-whens in the making. The evening reminded me that the joy and core of our food traditions is not in what is being made, but that something is being made at all, to share, and in this case made by all. We’d worried about that some in shifting from current standard fare to whole-foods, plant-based eating. Turns out, for naught. Here’s Vicki Brett-Gach’s Spicy Three Bean Veggie Chili recipe again (click recipe title). Any mix of three beans will do, no sweat if you don’t have exactly what’s in the recipe. 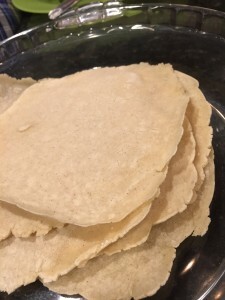 And here’s Mary McDougall’s Fresh Corn Tortilla recipe. The link takes you to her newsletter, scroll down and you’ll see the how-to instructions. To good food and health!